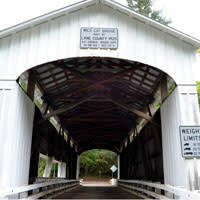 Just a short distance from Highway 126, Wildcat Covered Bridge, also known as "Wild Cat Bridge" or "Austa Bridge," is easy to visit. The nearby Austa boat ramp provides access to the Siuslaw River. Picnic alongside the river and cast out a line. 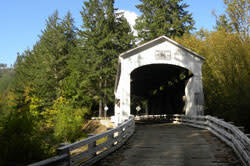 This classic covered bridge is part of a coastal range triad of covered bridges. Current Access - Vehicles up to 30 tons, maximum height 11&apos;5"
Built in 1925 as part of Stagecoach Road, the original route to the coast. In the 1930s, both the road and the bridge were bypassed by the Linslaw Tunnel and the Mapleton Bridge. Wildcat Bridge has a large window along one side. It is also possible to walk down to the water here and view the underside of the bridge. Wildcat Creek Bridge spans Wildcat Creek 75 feet (23 m). It was constructed in 1925 near the town of Walton. Just of Highway 126, it is one of the easiest covered bridges to visit on the way to the Oregon Coast. DIRECTIONS: Off Hwy 126 east of Mapleton near Walton. 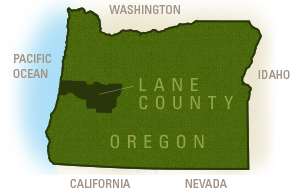 At Siuslaw Rd by the Whitaker Creek turnoff - go south to Austa Rd.